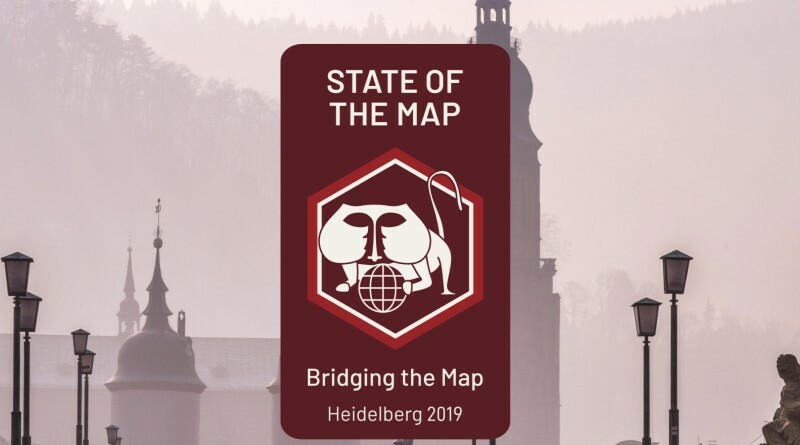 The global State of the Map 2019 conference this year will again feature a full day of academic talks. On behalf of the Scientific Committee, I am delighted to invite you to submit your abstract. We are looking for scientifically rigorous contributions between 500 and 800 words. Please consult the Call for Academic Abstracts for full details. Submission deadline is May 10. Questions should be sent to academic-sotm [at] openstreetmap [dot] org. This entry was posted in Uncategorized and tagged CfP, conference, events, OpenStreetMap, OSM on April 4, 2019 by jlevente. We are organizing a workshop at the AGILE 2019 conference which will be held this June in Limassol, Cyprus. The workshop is titled as “VGI HATcH – Using Volunteered Geographic Information for Help and Assistance in Transport and Humanitarian operations”. Consider submitting your contributions. Looking forward to seeing you there! This full-day workshop provides an opportunity for interested researchers and practitioners to share ideas and findings on innovative methods for the spatio-temporal analysis of crowd-sourced data, to demonstrate real-world applications using data from different crowd-sourcing platforms, and to discuss technical questions and innovations on data access and data fusion. The first portion of the workshop consists of short paper presentations under the general workshop theme. The second portion focuses on showcasing practical applications of VGI and social media. This includes but is not limited to: demonstrations of successful examples of using VGI/social media for humanitarian operations; use of VGI/social media for decision support in government on health societal or transport issues; use of VGI/social media or Open Data for improvement of base maps; short tutorials or demonstration of VGI/social media data analysis methods and data extraction from various online resources. Accepted papers and abstracts will be uploaded to the workshop Website. The workshop editors plan to host a special issue in the ISPRS International Journal of Geo-Information journal as a follow up to the workshop. Workshop presenters will be invited to submit full papers. We are looking for short paper or demo submissions in this domain. More info can be found on the workshop website at http://www.cs.nuim.ie/~pmooney/vgi-hatch2019/. Any questions, feel free to ask. This entry was posted in Uncategorized on February 13, 2019 by jlevente. Yes, another data import because they are not evil! Check these resources to learn more about how we added most buildings and address points to the map in Miami-Dade County. Join us on the OSMUS Slack if you want to talk maps! Self invite at https://osmus-slack.herokuapp.com, then join the #florida channel at osmus.slack.com. This entry was posted in Uncategorized on January 11, 2019 by jlevente. I created a dedicated page for my research at https://research.jlevente.com. I am looking for contributors who would help me out with some data. Check it out if you’re interested and sign up if you want to help. All info can be found on the website. This entry was posted in research and tagged help, mapillary, OpenStreetMap, research, social media on May 15, 2018 by jlevente. Last October I went to Colorado. The purpose of this trip wasn’t hiking (okay, I went hiking as well) but to attend the State of the Map US conference held at the University of Colorado Boulder. My talk was about how we’re trying to build a geospatial community in South Florida and I presented some results of our OSM building import. Recordings came online recently so here’s a video of my talk. Enjoy. P.S. Hiking was also great. You’ve got to visit Colorado during fall! It’s amazing. This entry was posted in Uncategorized on November 2, 2017 by jlevente. papers. Links to the articles are found on the Publications page. Weghe N., Raubal M. (Eds.) Progress in Location Based Services 2018. LBS 2018. Lecture Notes in Geoinformation and Cartography (pp. 293-313) Berlin: Springer. One of the research papers I’ve submitted recently (yes, about Pokémons!) dealt with spatial point pattern analysis. Visually it seemed that two of my point sets prefer to cluster around each other, in other words I suspected that Pokéstops have a preference of being close to Pokémon Gyms. Check the map below to see what I mean. Pokémon locations (cyan dots) are all over the place as opposed to Pokéstops (orange) that almost exclusively appear to be in the proximity of gyms (red). To confirm what’s obvious from the map, I used the bivariate version or Ripley’s K-function (a.k.a. the cross-K function) that can help us characterize two point patterns. As it turns out, it’s not as easy to interpret as I though it would be (at least with real world data) and I was trying to get my head around it for quite some time. As a result, I came up with a simple interactive visualization of this function to illustrate what it really means. If you’re anything like me and try to understand your stats instead of just reporting the results, you might want to read on more for some musings about the cross K-function. This entry was posted in stats and tagged d3.js, data, fun, map, maps, pokemon, R, visualization on April 6, 2017 by jlevente. If you like playing with data, chances are you’ve come across D3.js, Data-Driven Documents. Here are two of the first visualizations I made with it. I’m going to write up a more detailed blog post about it later. In the meantime – without commentary -just enjoy. !! UPDATE: check out my post about Mapillary’s Rhythm !! This entry was posted in mapillary and tagged animation, d3.js, data, mapillary, maps, visualization on February 18, 2017 by jlevente. Oops, I forgot to share my “new” videos I made this June. Better later then never, I guess. Anyways, it’s part of my research that aims to understand how regular people on the Internet use different mapping platforms. 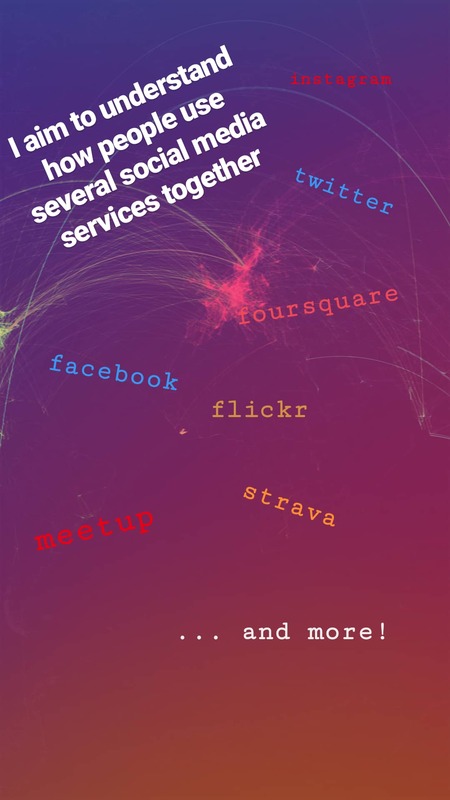 Well, not just mapping platforms but basically any platforms that you can think of including Instagram, Foursquare, Twitter, Facebook an many more. We know that many of you use multiple services during your daily routines. Previous research focused on each of these data sources separately so we have a lot of knowledge on them (not playing the Big Brother here, I’m talking about an aggregated level). However, we do not yet know how the same individual uses these services simultaneously. Do activity spaces overlap? Is there a single main service or do people use different services with the same intensity? Does the introduction of a new service affect previous usage patterns? Can the user base from a platform drained by another? How do these processes work in time and space? Well, and I have many more questions. Probably way more questions than I can realistically answer, especially when don’t just talk about simple social media photos but really high quality mapping activities (as in editing OpenStreetMap and taking Mapillary street level photos specifically for mapping). Nevertheless, I started working on this kind of research and made some early visualizations. Below are two videos showing how OpenStreetMap users pull images from Mapillary and edit the map based on other people’s contributions. How crazy is that? You grab one source of user generated content to improve another? Who would have thought about that 5 years ago? The first map shows to what extent an OSM mapper loaded Mapillary photos to his editor (cyan rectangles) and showcases (with labels) whenever an editing activity based on those photos could have been identified. It means that people really check photos over an extensive area just to see if they can find some new details to add to the map. I think it’s impressive. Read on to check another video! This entry was posted in Uncategorized and tagged animation, data donation, map, mapillary, OpenStreetMap, OSM, video on September 19, 2016 by jlevente. Where to catch ’em all? I should really stop playing around with side projects and should get back to my research. But look at this! I recorded a few hundred thousand Pokemon encounters over the past few days. You know, just for fun, because that’s what grown ups do. 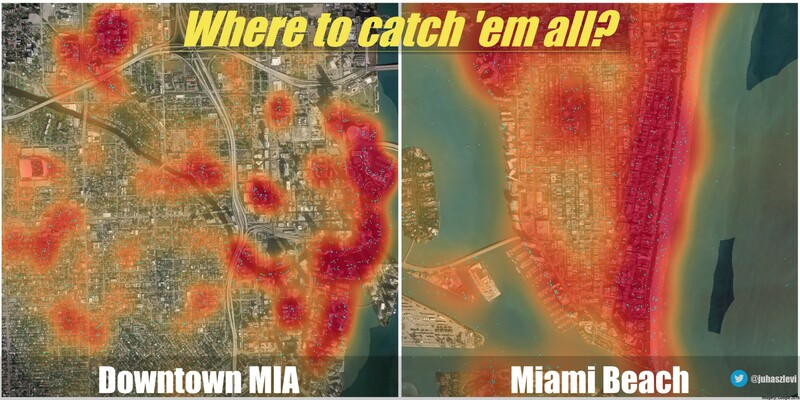 I marked all Pokemon locations in Downtown Miami and Miami Beach with cyan dots and created a heatmap on top of them to see where you should wonder if you want to catch as many as you can. Click for a high-res version. To be honest, I don’t play Pokemon Go. Was never into this thing. But I do like maps and data. And this is really cool data. So, I’m thinking. Maybe. What if I made it my research… what if I could come up with something really interesting? Oh, well. 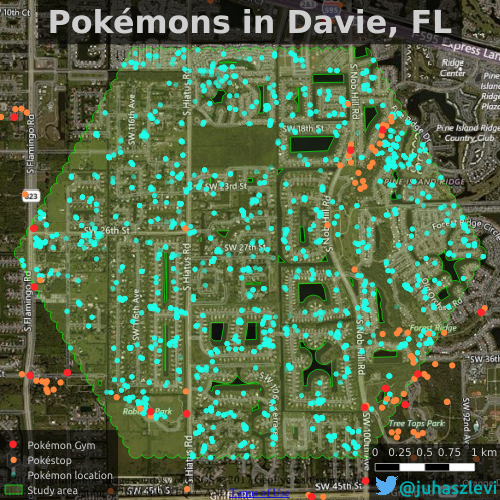 Instead of trying to justify myself, I guess I’m just gonna catch ’em all along with some awesome spatial analysis. This entry was posted in general and tagged data donation, data mining, fun, pokemon on August 5, 2016 by jlevente. This Monday I attended my very first Maptime Miami Meetup where Matthew Toro talked about a potentially great addition to Miami’s OSM… buildings! What makes a map detailed and fancy looking? I think it’s buildings. And landuse. And POIs. Oh well, I could continue adding items to this list for days without even starting to talk about it, really. But in any case, buildings are without a doubt the very foundation of what we can call a detailed map. Sadly, Miami’s OSM is not what we can call nice and detailed in its current state. It instantly becomes clear when you look at the map that it needs some improvement. But you know what? That’s the fun part of collaborative mapping. It’s really up to us how we build a useful map database and how detailed we want it to be. It’s us, regular people who add restaurants, bike lanes, shops and many other things we care about. Long story short, the Meetup was about importing a publicly available building dataset and making it an integral part of OpenStreetMap. I’ve decided to participate in the process, and I planned to help out with some basic stuff, throwing some ideas, maybe writing some code. You know, nothing fancy. At least that’s what I imagined. But as things rarely turn out the way we want them, now I’m the tech lead on this. Big words, I know, but they’re not mine. Red outline: current OSM buildings. Cyan spots: buildings to be imported. Now, that’s a lot of new buildings to add! This entry was posted in general, OpenStreetMap and tagged import, map, OpenStreetMap, OSM on May 19, 2016 by jlevente.